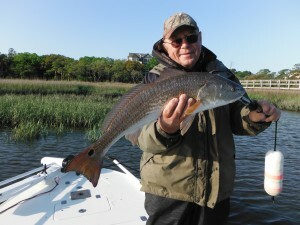 My charter fishing trips in Charleston and Folly Beach all had good catches of Redfish and some Trout this week. Though we continue to battle the weatherman at times the fishery has become more consistent as fish fall into their more predictable Spring patterns. Trout were being taken down current of oyster rakes and dock pilings at mid tide on DOA and Z-Man lures as well as mud minnows and live shrimp. Look for the larger Trout in 5 to 9 ft of water. Redfish ate soft plastic DOA and Z-Man swim baits deftly presented at low tide as well as cracked Blue Crab, Mullet, Shrimp and Pin fish on the last 90 minutes out the outgoing tide or the first 90 minutes of the incoming tide in 1 to 4 feet of water. Look for fishing to continue to improve as our waters warm and bait moves inshore. 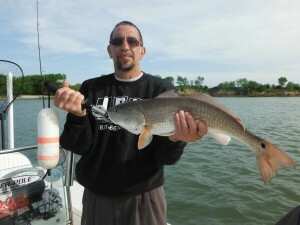 Gear up and get out there or contact me so we can set up a date to do some fishing. 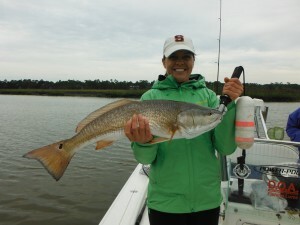 As always have a look at some of this weeks great anglers!